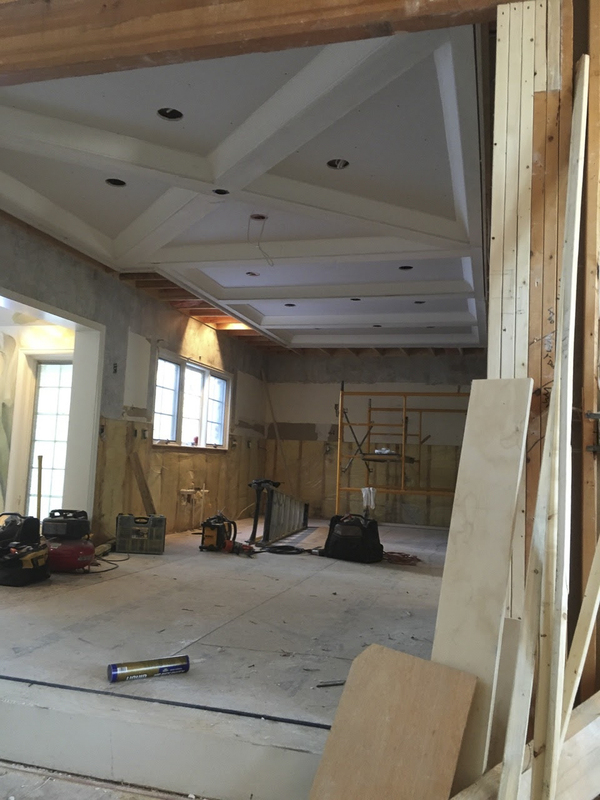 Coffered ceiling complete and awaiting wiring. Kitchen before. Discussing demolition plan. 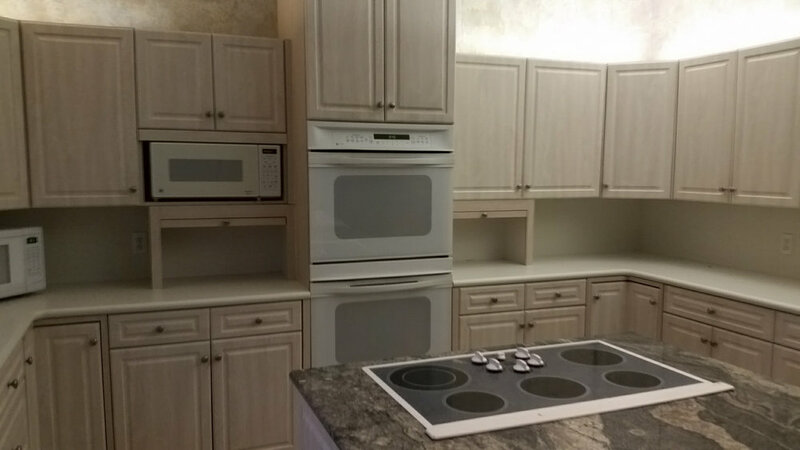 Kitchen Design by Design Classics. 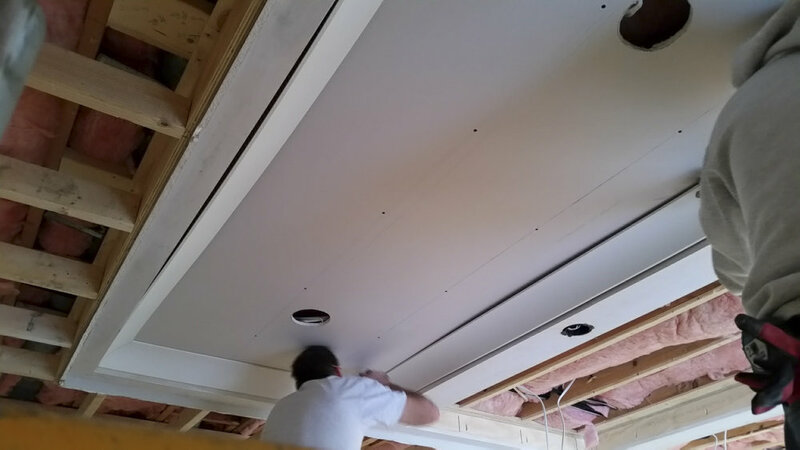 Plan for kitchen coffered ceiling. 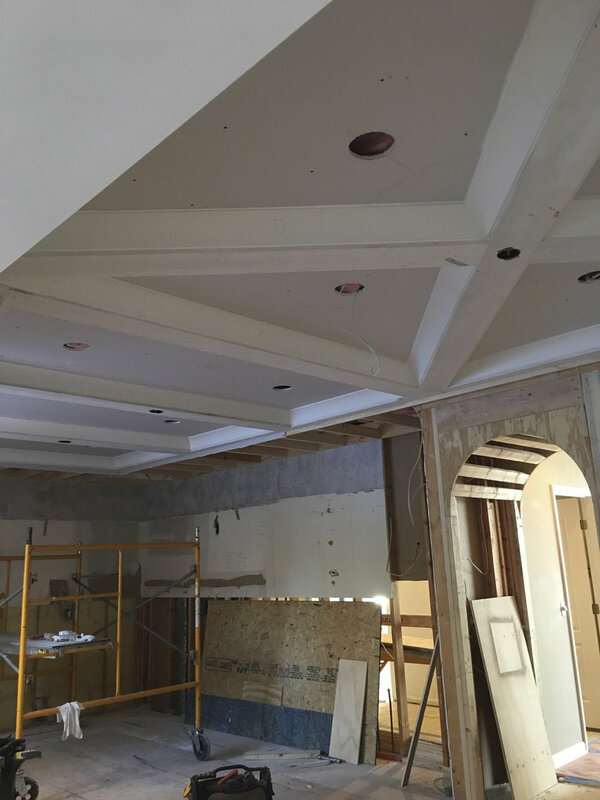 Coffered ceiling crafted by Valle Homes. Constructed on scaffolding to maximize efficiency. The entire assembly will be raised in one piece and secured to ceiling framing. 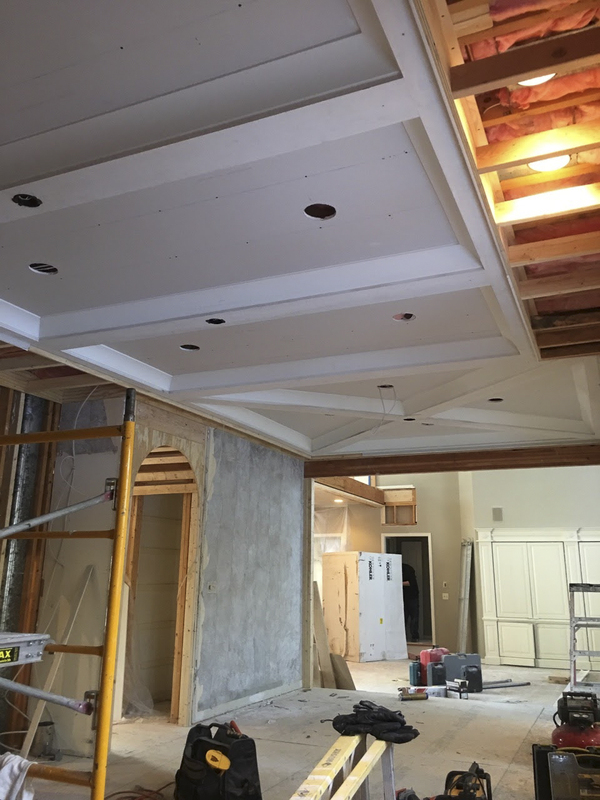 Coffered ceiling secured to ceiling framing. Securing crown molding and drywall panels. Garage before. Framing between the two doors on the left side of the frame will be removed to create one large single door. 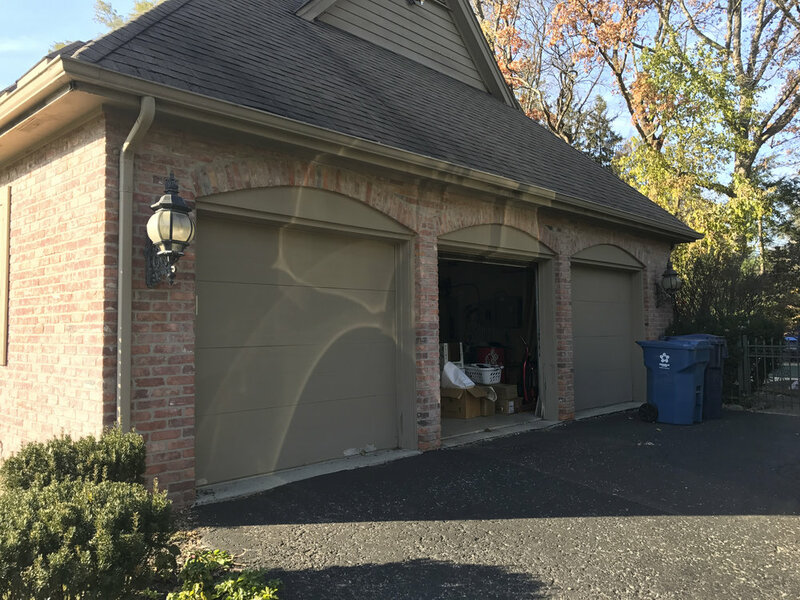 New garage door concept. Photo real rendering. 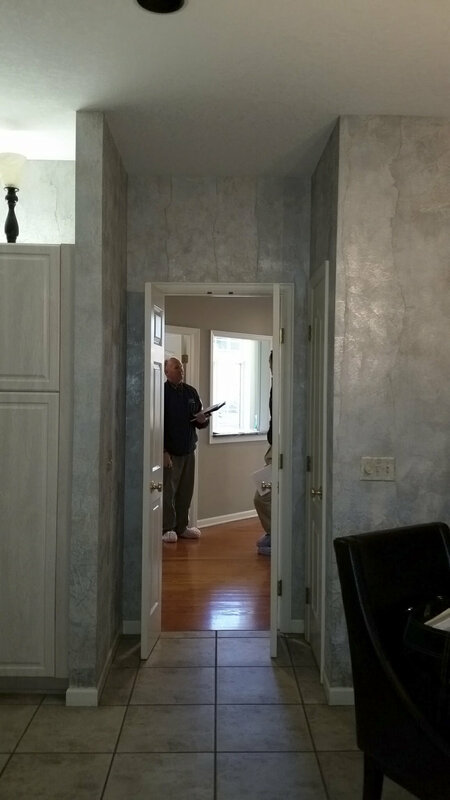 Existing cased opening and painted foyer. 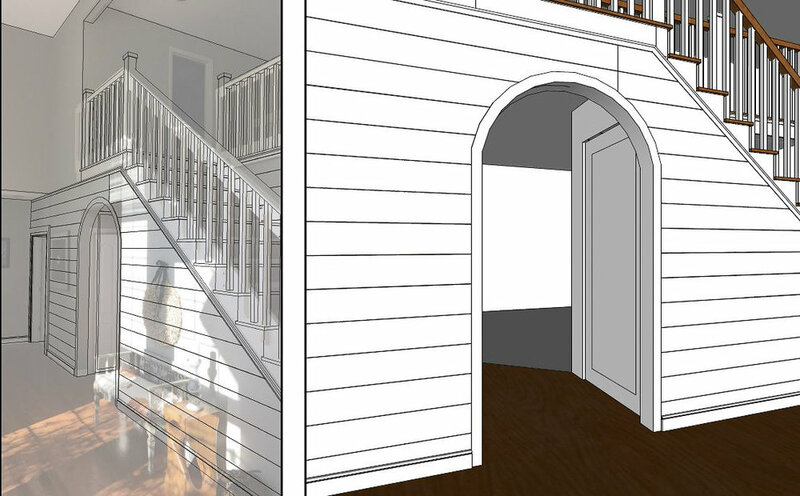 Exploring arched opening and shiplap walls in foyer. Visualizations by Valle Homes. 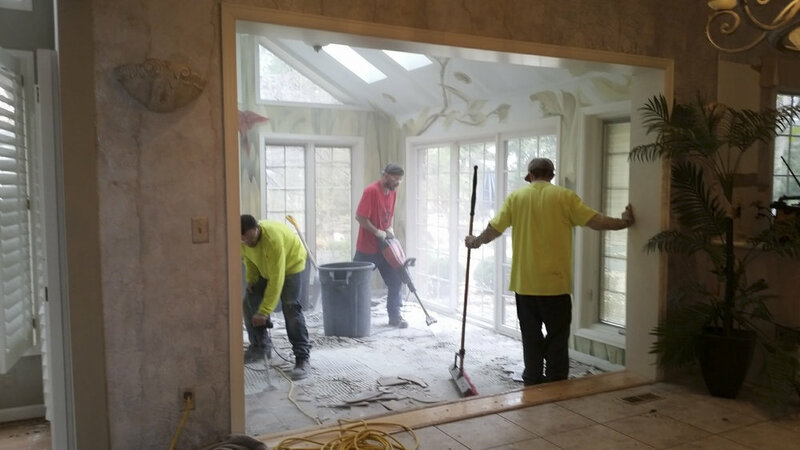 Mike's Hauling demo crew hard at work demoing the sunroom floor. Thanks for all your hard work! Cased open between mudroom and kitchen. To be converted to a paneled and cased arched opening featuring a hidden pantry drawer. Pantry drawer concept and functionality. Visualizations by Valle Homes. 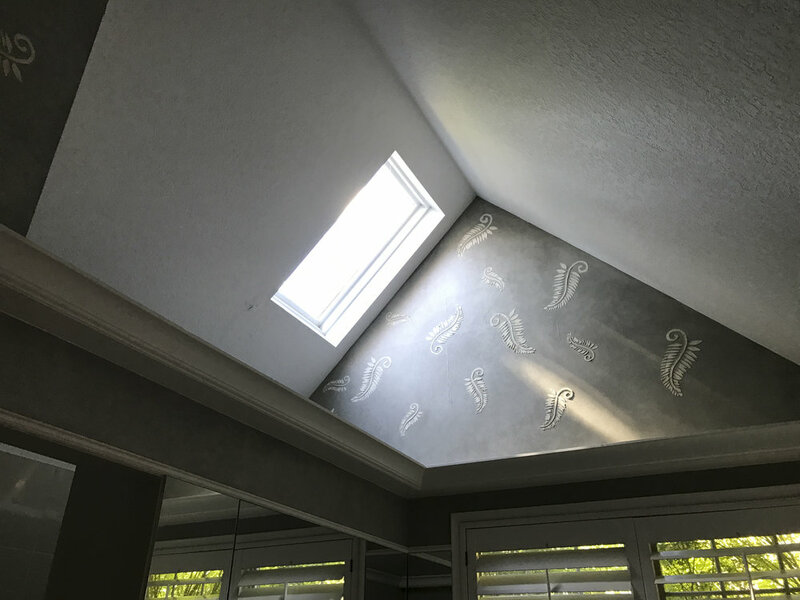 Existing, master bath skylight. This area will framed to create a ceiling for the shower and project the light shaft to new bathing area. Existing jacuzzi tub. To be replaced with free-standing, soaking tub. Old, master bath vanity removed. New skylight shaft with exposed timber ceiling. Concept for open tread stairway with wood banister. 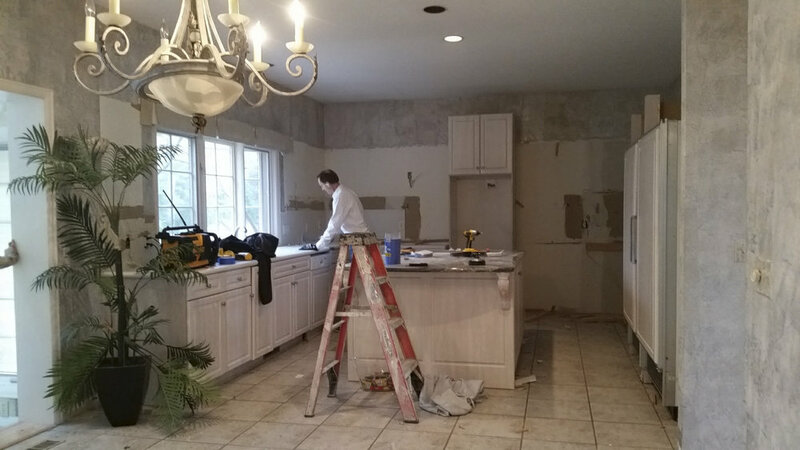 Drywall on this side of the foyer will be replaced with shiplap. Carpeting, railings and drywall removed from stairway and foyer walls. Arched opening framed in. The stairway is coming along nicely. Shiplap installed on foyer and stairway walls. Finishing treads and risers. Landing and catwalk trimmed. Now, how to position the carpet runner? Under-utilized space reworked to create the new laundry room. Laundry design by Design Classics. 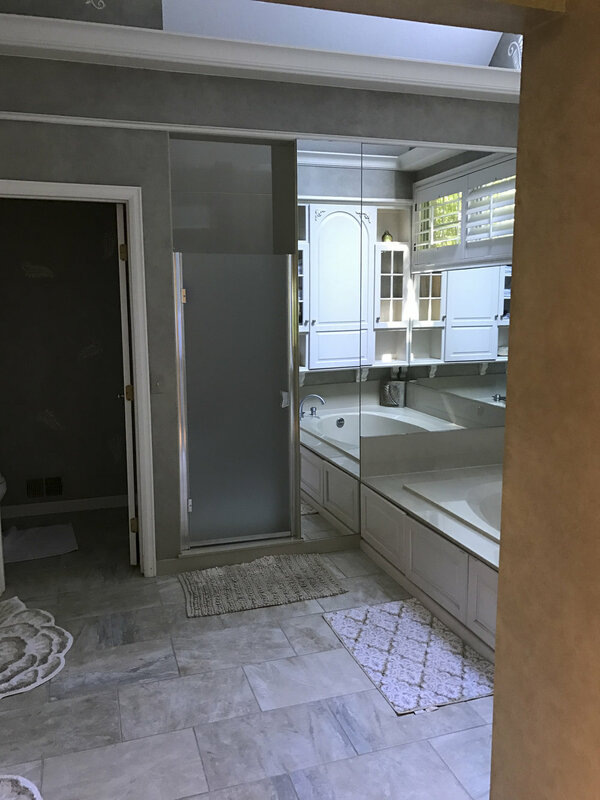 Existing, bonus space. 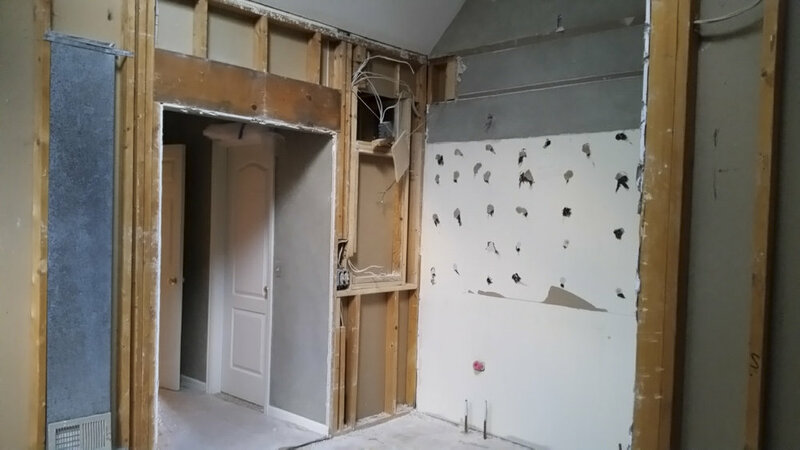 Demoed and ready for transformation to laundry room. Garage entry on the left side of the frame will be the freshly designed mudroom. Existing fireplace in the great room. New fireplace design to accommodate a flat screen TV. Carries over the shiplap element from the foyer. 2nd floor balcony awaiting new flooring and railing. Hudick Drywall scraping and coating popcorn ceilings. 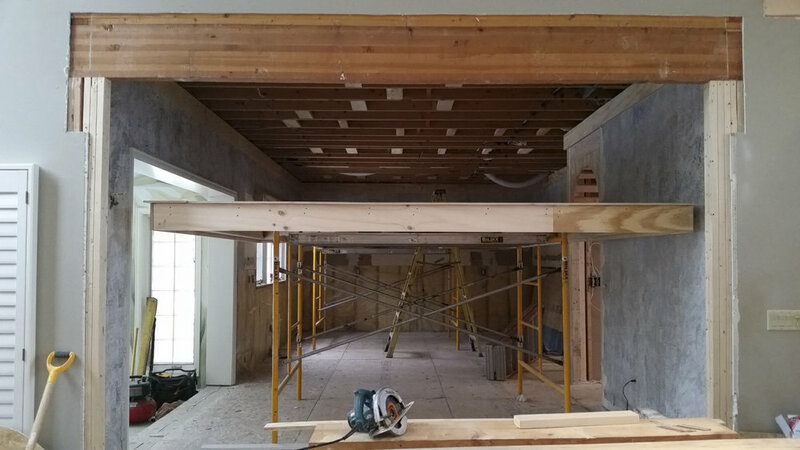 Header between the great room and kitchen raised to open the space. The renovated dining room will receive new windows and flooring as well as an updated bar.